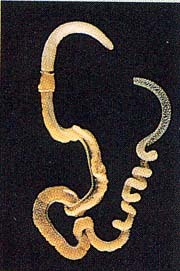 Acorn worms range in size from 9-45cm in length. The body is made up of three parts. An acorn shaped proboscis, a short fleshy collar and a long trunk. The mouth is located behind the proboscis at the collar. Covering the skin are cilia and mucus secreting glands. They feed on detritus to extract the organic material. They have a characteristic diverticulum stomochord that extends into the proboscis. They are aquatic organisms and respire through the use of gill slits. The majority of their lifetime is spent in u-shaped burrows. They have separate sexes and the eggs are fertilized externally. Other than being of scientific significance because they are closely related to echinoderms, acorn worms are of no known importance to humans. "Acorn Worms". Wild Fact Sheets. Retrieved from: http://www.wildsingapore.com/wildfacts/worm/enteropneusta/enteropneusta.htm.